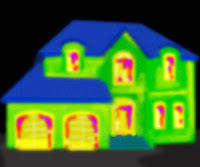 An energy audit is the first step to determine how much energy your home, business or commercial space consumes. An audit will reveal problem areas and help a contractor recommend improvements that can save money and energy over time. An audit evaluates many parts of a building including insulation, HVAC and other elements that affect the building’s energy performance. Reduced energy bills. The reduction in your energy bills can help pay for the improvements beginning day one. Increased comfort. When air leaks and other problem areas are identified, they can be properly updated and sealed. This helps maintain your building’s internal temperature and increases comfort for residents. Higher indoor air quality. Sealing air leaks helps to keep pollutants out, helping to maintain indoor air quality. An audit can also identify ventilation improvements to your home to help improve fresh air exchange. Environmental benefit. Reducing energy consumption helps reduce your carbon footprint. A blower door test helps identify air leaks throughout a building’s envelope (i.e., foundation, walls, ceiling, windows, and doors). In addition to finding air leaks, the blower door test will also assess the effectiveness of any existing air sealing. During the blower door test a powerful fan is mounted on an exterior door. This fan draws air out of the house, revealing cracks and crevices that are allowing air to infiltrate the home, resulting in inefficiency. An infrared scan is another great way to detect air leakage in the home. 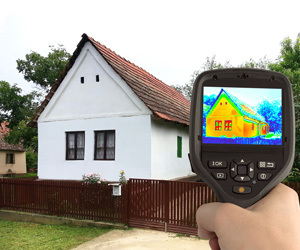 These thermal images detect heat variations in a building envelope, providing visual confirmation of areas losing energy that need attention (e.g., air sealing, insulation, etc.). Covering and sealing recessed (can) lights that penetrate into the attic floor prior to installing insulation. Sealing the attic floor and air ducts prior to insulating. Sealing the chase (hole) in the attic around the plumbing vent pipe. Weather stripping and insulating the attic hatch or door. Sealing between your crawl space and home to protect against moisture, mildew and air quality problems. Interested in a free energy audit? Contact the City of Tallahassee to have a free energy audit performed on your home.